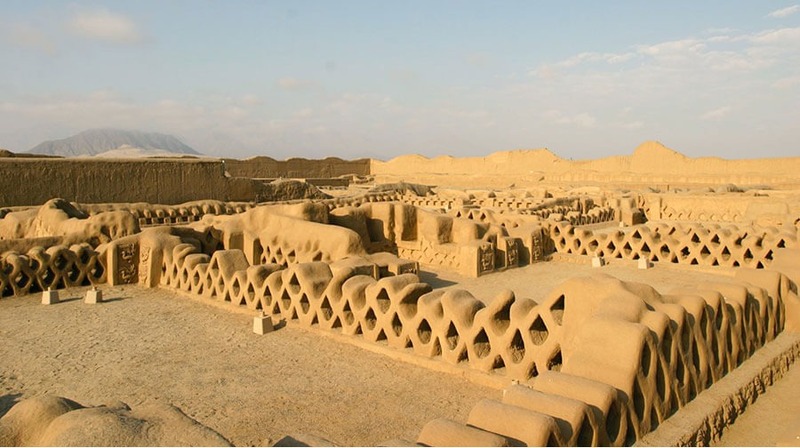 The great adobe (mud brick) city of Chan Chan lies about 500 km north of Lima, next to the city of Trujillo, the third most populated city in Peru. Although less visited than Machu Picchu, the ruined city of Chan Chan put Trujillo on the map. Chan Chan was at the height of its power in the 15th century until it got conquered by the Inca Empire in 1470. 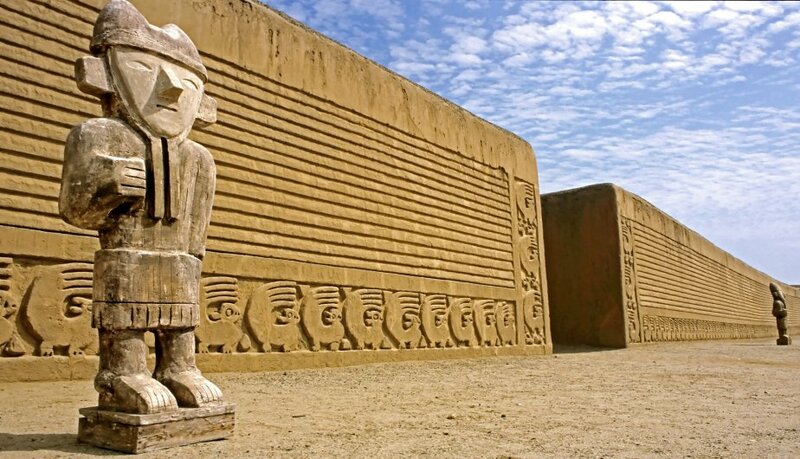 As Chan Chan was the capital of the Chimu kingdom, this meant the end of their civilization. Only 50 years after becoming part of the Inca territory, the Spanish came and looted Chan Chan’s riches and artefacts. After being deserted and robbed of all its glory for centuries, the site finally got listed as a UNESCO world heritage site in 1986. Since then a lot has changed. The former glory may have been lost forever but thanks to elaborate restorations over the past 30 years, Chan Chan has become one of the most restored sites in South America. Even if you feel that would hurt its authenticity, it cannot be denied that the city becomes alive because of it. When you walk through the gates of Chan Chan you get catapulted to a different time and place. Chan Chan is the largest city of the Pre-Columbian Era in South America and the largest adobe (mud brick) city in the world. The entire complex spanned over more than 20km² and it is estimated to have had over 30,000 inhabitants at the top of its glory while the Chimu Kingdom had more than 500,000 inhabitants. Next to being the residence of the king, queens and priests, Chan Chan served as the commercial, political and administrative centre of the Chimu Kingdom. At the centre of the city, which spans over 6km2, lie extravagant ‘ciudadelas’ or palaces. These large architectural masterpieces functioned as storage, residence, mausoleum, temple and administrative centre. Outside of these areas lie the compounds and centres for textile weaving, metalworking and woodworking, etc. At the outskirts of these compounds there were the houses of the farmers. Only the palaces and the compounds have been reserved.HOP includes this wonderful tour included in your plan of volunteer without any extra fee (depending of your program) review what include and not in your table program. This tour will also give you access to the the museum and the moon temple in Trujillo (biggest adobe pyramid in Peru) built by the Moche civilisation, which is also a great place. We leave Trujillo for Conache and start the excursion heading towards Laredo district. In Conache, there we find a beautiful lake and carob trees. 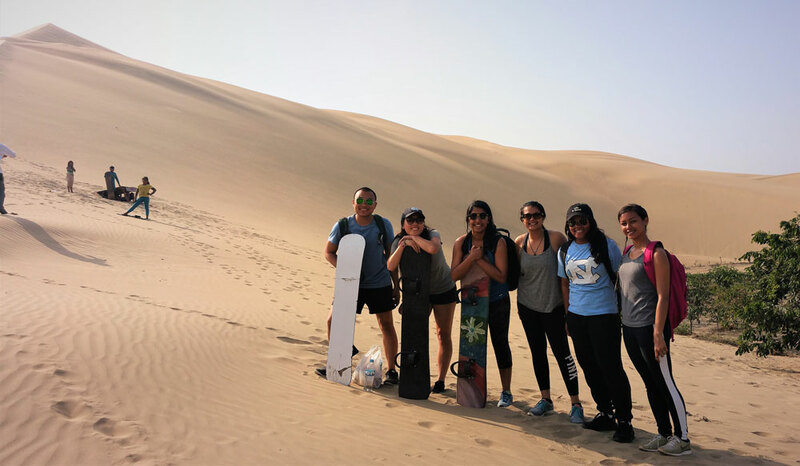 The Conache Lake is surrounded by huge and warm dunes, where we can practice sandboarding, the best way to spend time outdoors in Trujillo. First we will warm up and stretch our muscles before start practicing sandboarding. After that, we will ride down over the steep sand dunes and feel the adrenaline to the maximun. Also, we can chill out and enjoy the lake's water of this amazing oasis. Shake off the sand!! and experience the excitement and speed of this sport. 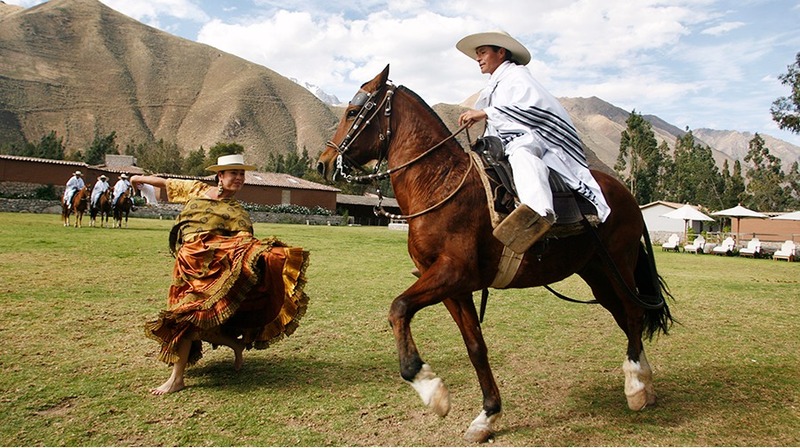 Enjoy a pleasant afternoon experiencing the equestrian world of a traditional hacienda and learning about Peruvian Paso horses and what makes them distinct from other horse species. You will enjoy watching an impressive show showcasing the ability of both the horses and the horsemen. Get this amazing experience together with professional surfers, they teach all levels, from beginners to advanced and competitive surfers. The lessons will be located in front of the beach “El Elio” in Huanchaco, where you can always count on good surfing conditions. You need to know we take this activity like cultura because Huanchaco our home town, is recognized by the UNESCO World like a Surfing Reserve. 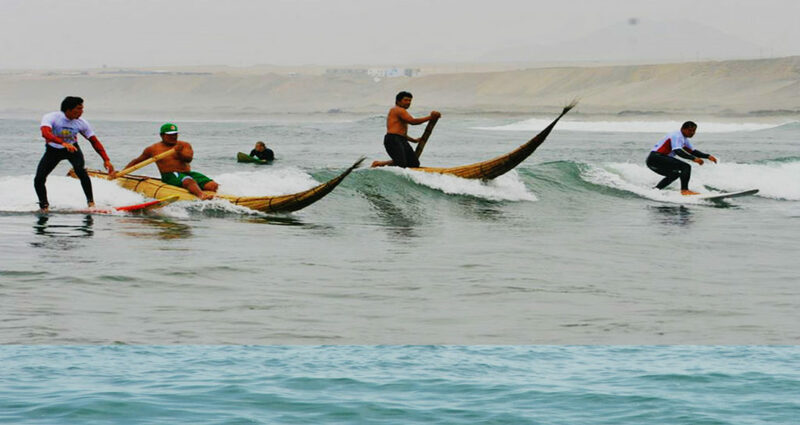 Surfing originated in Huanchaco with traditional reed boats, Caballitos de Totora. On days off from surfing you can take a caballito tour and even fish and prepare your own ceviche.